Dropping into Sonoma’s Alexander Valley searching for deLorimier Winery, you begin to think you’re going to taste a bottle of wine from a giant corporate behemoth. The winery is dwarfed by a silver gleaming glass and metal structure perched upon a hill overlooking the winery. It’s the local Indian gaming casino. 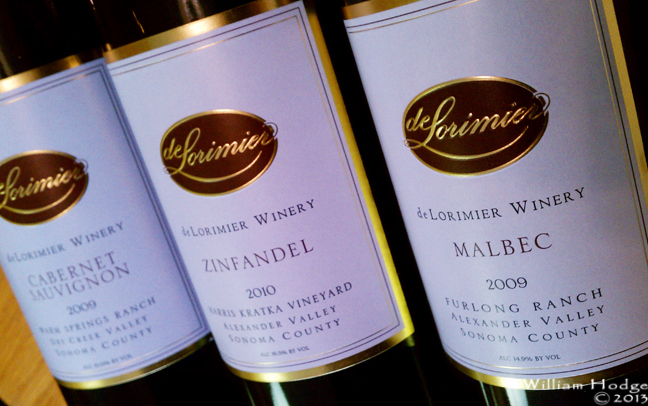 deLorimier is part of a larger company, Wilson Artisan Wines. Their wine cellar includes, Wilson Winery, Mazzocco Sonoma, Matrix Winery, Jaxon Keys Winery, Soda Rock Winery, Pezzi King Vineyards and St. Anne’s Crossing. It’s owners are Ken and Diane Wilson, who are active in the community and host the yearly Children of Vineyard Workers Scholarship Fund. 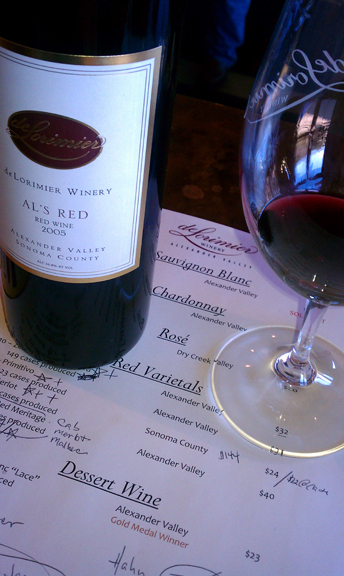 After spending a day in Healdsburg, we were curious to see what a bottle of wine from Alexander Valley might hold for us. It’s a pretty place, the valley floor isn’t very wide but it’s long and surrounded by the gentle hills of Sonoma County. The winery is similar to many other wine estates with a large tasting room and its U-shaped bar stocked with bottles of wine. We were pleased with the wine, much of it from 2006 and 2007, nothing newer than 2010 vintages. There was not a single –✰ in the bunch (look below for our ranking system.) As with any experience, tasting in a new region brings a whole new taste sensation. Not only is it the earth, the dirt (or the terrior as they say in the wine world) that makes a difference to the taste, but it’s how the local vintners savor those grapes. The taste depends upon everything from the winter trimming of vines (or extreme reduction as they say in the bonsai world) to smoking (burning) the casks, to the mix of new and old casks to the mixing of wines from disparate, unique casks that create a bottle of wine we all might enjoy. As we’ve said before, we are looking for a winemaker whose palate suits our palate. We’re looking for a winemaker who knows where to source the grapes, how to ferment them and blend them and create a bottle of wine we personally enjoy. And, deLorimier certainly filled our glasses with wine we enjoyed, at a price point that made the price to taste ratio a good bottle of wine purchase. We did purchase a number of well priced great tasting bottles during our visit. And the best news is, they hold up. The bottles of wine taste just as good at home as they did at the winery. That is the true test of wine, will you like it as much at home as you did at the winery? Their wine is not available at Total Wine nor BevMo. 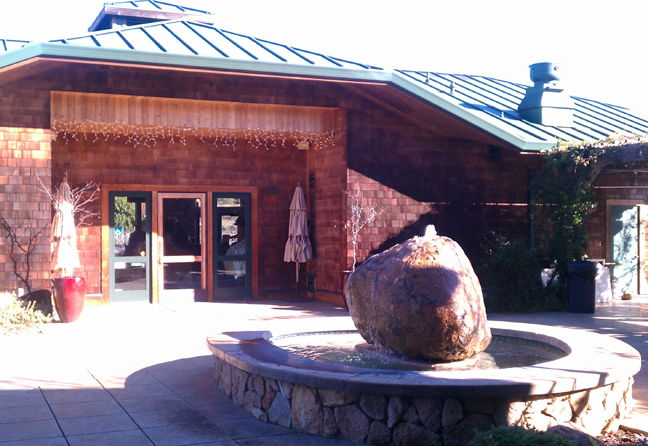 The estate winery is located at 2001 Highway 128, in Geyserville. Tastings are $5. Notes on Our Wine Ranking System – We use a very simple way of ranking a bottle of wine. We do this with a ✰ system so that no wine maker is ever insulted by our note taking. A ✰ means the wine is good, we have no problem drinking this wine anywhere (specially at a party when the wine might be hosted.) When you see a minus sign before the ✰ we’re not liking it too much. ✰ + + means -We’re hooked and we’re going to buy this bottle of wine. This entry was posted in Alexander Valley, Blend, Cabernet Sauvignon, Chardonnay, GSM, Healdsburg, Merlot, Pinot, Sonoma, The Pleasures of Tasting Wine, Thoughts About Wine - Exploding Ruby Flowers On Your Palette, Zinfandel and tagged alexander, bottle, bottle of wine, cabernet, california, Sauvignon, valley, wine, wine tasting room, wineries, zinfandel.